Jumanji: Welcome To The Jungle is slated to hit theaters December 20. If you are an Amazon Prime member, you may be able to catch an early look. The film will screen for Prime customers at 7PM local time on December 8! The promotion allows members to buy up to 10 tickets for the one-time showing at over 1,000 theaters across the U.S., including Regal, ArcLight Cinemas and National Amusements theaters with AMC theaters being added soon. 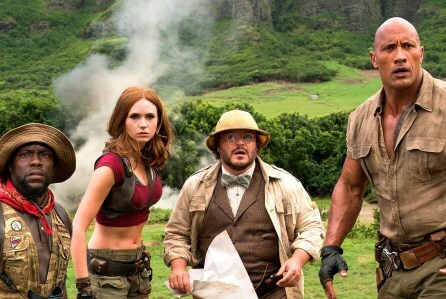 Jumanji: Welcome To The Jungle, directed by Jake Kasdan, stars Dwayne Johnson, Jack Black, Kevin Hart, Karen Gillan, Nick Jonas and Bobby Cannavale. The reboot features four teenagers in detention who discover an old video game console with a game they’ve never heard of, they are immediately thrust into its jungle setting, and the bodies of their avatars. What they discover is that you don’t just play Jumanji, Jumanji plays you. Sony has also created a 360-degree VR scavenger hunt where folks can explore the jungle, learn about the characters and get a sneak peek at how the legend unfolds. Designed to work across a variety of devices, Johnson will share the experience with his Facebook page.